Was timber a key material in one of your construction projects? Did you choose wood for its many aesthetic, natural and architectural properties, or simply because it is the only renewable building material? If yes, you can enter your project for a World Architecture Festival prize! For the second time, PEFC is sponsoring the WAF Best Use of Certified Timber Prize, rewarding architects and project teams for their use of certified timber as a main construction material for buildings outstanding in sustainability, innovation, quality or aesthetics. 40 architects from 20 countries entered their projects into the prize in 2018. After a live presentation of the nine shortlisted projects, a jury of three experts, including architect Mark Thomson, chose International House in Sydney, designed by Tzannes and developed by Lend Lease, as the winner. With its seven floors, International House is the world’s tallest all‐commercial building constructed fully from engineered timber. It catches the eye with its clear glass façade and, with its very low carbon outcome, sets new standards in sustainable construction. 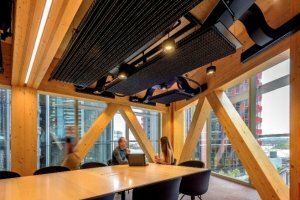 For Mark Thomson, the winning project highlighted how timber is breaking new ground in commercial construction. All projects entered for any of the 17 ‘Completed Buildings’ award categories are eligible for the Best Use of Certified Timber Prize. Simply check the box next to “Please consider me for Best Use of Certified Timber Prize” under “Enter into additional WAF Prizes”. Please remember that the use of certified wood products is a precondition for entering the prize. During the submission process, you will be asked to provide details on the percentage of certified material used on your project. To get started, head to the WAF website! 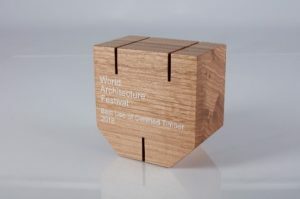 The 12th World Architecture Festival will take place in Amsterdam from 4-6 December 2019. After hearing presentations of the 10 best entries in the morning of Friday 6 December, the jury will announce the winner at a Gala Dinner in the evening. Please note that the deadline for entry is 3 May 2019. Start you submission now! Across the world, the architecture community is embracing solid and engineered wood to deliver high profile, award winning projects and everyday designs – from houses, schools and hotels to restaurants, theatres, supermarkets and swimming pools. Under the theme Designing the Future with Sustainable Timber, a range of stakeholders have come together under the leadership of PEFC to promote the use of wood in construction in general and certified wood in particular. Join us! Contact us at fabienne.sinclair@pefc.org. Certification matters as it demonstrates that wood used in construction is sourced sustainably and a positive choice has been made to design and build with a future for healthy forests in mind. PEFC-certified timber and engineered wood products are readily available for your construction projects from a wide range of global suppliers. Construction projects obtain PEFC Project Chain of Custody certification to demonstrate excellence in responsible sourcing. PEFC, the Programme for the Endorsement of Forest Certification, is the world’s leading forest certification system. More than 300 million hectares of forests – that is 60% of globally certified forest area – are certified to PEFC’s internationally recognized Sustainability Benchmarks. Those forests supply more than 20,000 Chain of Custody certified companies with responsibly sourced timber and wood-based products. PEFC was founded by small- and family forest owners to demonstrate excellence in sustainable forest management.